It's the only ballpark in America where home runs can be "splash hits." Where the breathtaking Bay views rival the action on the field. Where one of baseball's most hallowed franchises plays inside an architectural landmark. On your behind-the-scenes ballpark tour of sensational AT&T Park, the home of the San Francisco Giants, you will get to go places only the players and staff go. In 1999, the San Francisco Giants created Giants Enterprises, a new business venture established to develop non-baseball events for AT&T Park. 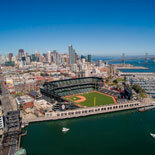 Called 'baseball's perfect address', AT&T Park opened in 2000 as the home of the San Francisco Giants and immediately became a landmark in a city of landmarks with unlimited possibilities for use. Visitors' Clubhouse: Get a behind-the-scenes look at where the pros suit up before they hit the field. Batting Tunnels: These lighted batting areas feature two cages side-by-side, and can be equipped with a pitching machine. Whether you're a coach for a team of Little Leaguers, or an executive wanting to build teamwork, these batting cages are sure to be a hit. Coca-Cola Fan Lot: Whether you're a kid, or just a kid at heart, you'll have a ball at the Coca-Cola Fan Lot. This interactive play area includes four slides inside the 80-foot contour bottle, a mini-AT&T Park complete with video scoreboard and a speed pitch game. The world's largest baseball glove, a vintage three-finger classic, strikes a stately pose overhead. The Coca-Cola Fan Lot is definitely a must see! The Fan Lot will be available for use on the weekends, and when the Giants are out of town during June, July, and August. Field Club Lounge: This sophisticated lounge is beautifully appointed with cherry wood paneling and dramatic WPA-style murals. Large floor-to-ceiling windows look out onto the historic Lefty O'Doul Bridge, and an attached outdoor terrace provides a beautiful view of the Bay Bridge and San Francisco's waterfront. 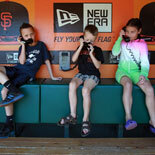 Get a true San Francisco experience, get your eTicket and go behind the scenes where the Giants call home - AT&T Park! 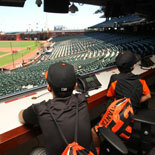 This tour is great for: Adults & kids of all ages, San Francisco Travelers and Tourists, Baseball Fanatics and Local Giants Fans. 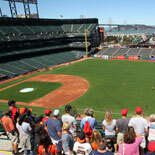 Home of the Giants - It's the only ballpark in America where home runs can be "splash hits." You will get to go places only the players and staff go. Available every day at 10:30 am and 12:30 pm rain or shine, except when day games are scheduled at AT&T Park. No tours on major holidays. Your purchase guarantees a ticket. However, a reservation confirmation is necessary after purchase. All details included on E-Ticket. 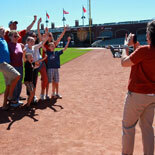 Tours depart from the Giants Dugout Store at AT&T Park, 24 Willie Mays Plaza, San Francisco, CA 94107. Present this eTicket at the Tickets counter in the back of the Giants Dugout Store at AT&T Park on Third Street. Permit parking available in Lot A (see directions below). Due to surrounding construction some streets may be temporarily closed. Please allow enough travel time to arrive at the ballpark parking. Seniors: 55 and over. Child Ticket: 12 and under. Children under 2 are Free. Tour stops are subject to change depending upon team schedule and area availability. AT&T Park is a smoke-free facility.